I was diagnosed with Bipolar Type II and they prescribed me a drug known as Lamictal. They told me to look for a Lamictal Rash known as Steven Johnson Syndrome that could potentionally become fatal. I didn't believe them that a RASH could become fatal but little did I know, 3 months AFTER I was taking this medication, I started to get small red bumps on my lower back that started to spread throughout the week. Within a week and a half, the rash took over my entire body. Doctors, even Dermatologists were stunned by this rash. I had this for a little over 2 months. Taking time away from work and other normal activities. It was hell. It burned, and itches and left me with scars all over the body. Scariest 2 months of my entire life being in and out of the hospital. Skin swelling up and then going back down. I am not saying that everyone will get this rash, but if I were you, I wouldn't take any chances. Dermatologists Could Not Diagnose! Found the cause myself! Thank Heavens for the Internet! This is not the first time that after visiting doctors that I have had to do investigative work regarding a health condition. When a doctor says they are "practicing" ... they are doing precisely that. They do not know everything and they overlook things that stare them right in the face quite often. Furthermore, many doctors hate that we, the patient, can empower ourselves and do our own research regarding our health. I try to refrain from self diagnosis but after two months of having this rash and visiting two separate dermatologists, who both kept telling me my problem is acne, I thank GOD for the Internet! After a week since my last visit to the Dermatologist with not one ounce of improvement, I decided to do my own sleuthing and found that I am not alone with this rash and that my 250mg dose of Lamictal is the cause. I had been given this increased dosage in January of this year. I called my Psychiatrist yesterday and she told me today to stop Lamictal immediately. I was never warned about a possible rash. I found out the hard way. All doctors should be required to cross check their patient's medications into a database to check for possible ramifications for a drug. The pharmacist can do so, so there is no excuse for a doctor to not be able to. I gave both of these dermatologists my medications and dosages and they were blatantly wrong in their diagnosis. No allergy testing and both just gave benzoyl peroxide wash, hydrocortisone, tretinoin cream, and oral Doxycycline capsules. They basically said be patient and you should see results after a month. They both wanted me to return in three months! I would have looked like this poor girl at the top of the page by then and been hospitalized. Thank you for this information and for making people aware of this harmful drug. I am hoping I do not have scars once it heals. My main aim is to get rid of the bumps first and keep my skin hydrated, then I will start with Mederma and topical vitamin E as well. The rash is on my chin, neck, around ears, temples and upper chest and it is painful! I have to shower with cool water and the rash burns even in the cool water. This is a nightmare. Good luck to all who have this. My niece is fighting for her life because of the rash from Lamictal! I think that if drug companies, doctors, etc. 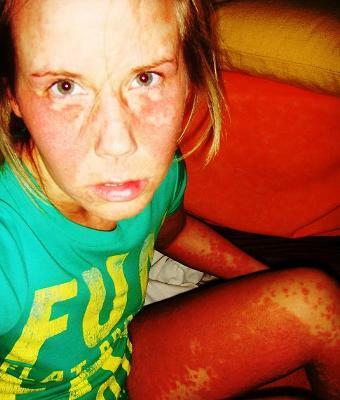 showed people a picture of someone who got the rash, NOBODY would take a chance and take this drug! Her life is a living HELL right now. She is living in a burn unit! People, please think twice about taking this drug! She only has skin on her head, feet and hands! It is horrible! The pain is intolerable! I was on Zoloft for a couple of years and then I stopped taking the medication and I had the worst two weeks I have ever lived through. The doctor had put me on lamictal at the same time. Now I have a small bumpy rash inside my elbow area. I do not want to get off lamictal because I have just started to feel a little better. What would you do? I haven't logged into this page in a while and noticed a few more comments on my photo. Some of which endured this rash as well. I hope you guys came out okay and are feeling better. They have me on that medication as well. I just started taking it and I have been reading up on the lamictal and I will be honest with you, I do not want to take it anymore. The risks are still too great for me. I have children that I have to take care of everyday! The doctor told me it will calm my anger and lessen my anxiety. I am only on 25 mgs right now but since I have been taking it my chest seems so tight and with very little exertion I get winded. I do not know what that is all about but I am going to call my doctor back and tell her I do not want to take the lamictal anymore. Yeah, I know it works for some people and the chances of the SJS Rash are very small. My bad luck must have decided to show up those few months! It was the most pain I have ever endured though, I can tell you that much! Lamictal was working for me, but I was having symptoms of the rash so I had to stop it. I was bummed. Hope you are doing better now. Ouch! I will never try lamictal now because of this picture! Heartbreaking! Within one week of taking Lamictal (25 mg), I have the rash all over my whole body. It looks horrible and it's EXTREMELY itchy. I'm too humiliated to go out looking like this in public. And another thing, the rash keeps getting worse, ALTHOUGH I stopped taking the medication after a week. It's now a week later and this is ridiculous.